I am not the kind of person who posts motivational quotes and aphorisms to my Facebook status or to my Twitter account. And when my friends do, I usually just skip over it, as those sorts of things are not why I hang out in online social spaces. But earlier this week, in very short order, three separate Twitter friends posted such things, and for some reason it hit me in a very positive way. This is a wonderful trio of self-reliance reminders. Read them from the bottom up, and it’s almost like they are three people talking to one another about the issue. I like that final motto: Do hard things. Many of my friends (both in-person and on Facebook) know that a couple of months ago I bought the strangest looking shoes you can imagine: shoes with toes. They’re called Vibram Five Fingers. Before I told you what I thought of them, I wanted to wear them for a goodly period of time, to be fair. I wanted to get past the novelty factor as well as the strangeness of wearing shoes with toes. Vibram Five Fingers Shoes — Review from Brad Rourke on Vimeo. Bottom line: They aren’t for everyone, but I really love them. At a minimum, they are incredible conversation starters! Everywhere I go someone wants to talk to me about my feet. P.S. Sadly, I shot the video in 16×9 and somehow it ended up 4×3 . . . so I am all squishy. You will just have to deal. Even the great icons – I’ve always thought that, when you look at their achievements they pale in comparison to political and historical figures. This all came into relief when yesterday’s Michael Jackson funeral eclipsed news of the death of Robert MacNamara. The crank in me went on overdrive. Not that I see MacNamara as a hero or anything – just that his passing seems more geopolitically notable than the death of a pop star. And yet there was my CNN Breaking News alert: “Michael Jackson’s golden coffin is placed in front of the stage as his memorial service gets under way in Los Angeles.” This is breaking news? “What did he ever do?” I curmudgeonly asked myself of Jackson, and then I was hit with the answer that made me do a one-eighty. Michael Jackson, through his music, brought joy into people’s lives around the world. I was filled with remorse as I thought of my snobbery. My point is not that Michael Jackson’s accomplishments are greater, or lesser, than other’s. My point is that it is perfectly understandable that we care about and mourn his passing in ways that go far beyond the notice we pay to historical figures. How dare I sneer at that. How dare any of us dismiss that. Entertainers enter our daily lives. By doing so, they change our daily lives. Historical figures, by contrast, direct events that seem distant. So whose passing do you notice more? Again, I do not mean to disparage or speak ill of anyone – living or dead. It is this phenomenon that is interesting. I wanted to share this personal epiphany. I think I finally get it, and it’s pretty simple really: People care about what touches them. And what touches them is what they care about. I was talking to a friend the other day about a family event he had to attend. For him, such events are not positive. His family is filled with bickering, infighting, recriminations. At group events, he dreads the point that always comes, when one family members starts talking trash about another one, and demands some kind of response. You either agree, which allows you to avoid being yelled at for now — but the target of the trash talk gets upset. Or you don’t — in which case the target likes you but the person in your face talking the trash gets hot under the collar. It got me thinking, though, about just how many people are basically negative. It’s not a lot, but it’s enough to put a damper on things when they get going. I would like to come up with some neutral comments that don’t reinforce the negativity but encourage the person to be a bit more positive. Maybe that’s too much to ask. Maybe a better goal is to look at myself first, and just make sure I am not inadvertently contributing to general bad Karma. My good friend Cindy Cotte Griffiths is a prodigious volunteer and always has been. She’s the leader of a Cub Scout pack, chair of a city commission, active in her church, and in her childrens’ schools. She’s also my partner in the hyperlocal news site, Rockville Central. The other day Cindy wrote about the pull online commitments can exert, in the face of offline, real world interactions. We seem constantly pulled away from reality to tend to online business. For many, this can be vexing. For volunteers intent on helping those around them, it can be even more of a dilemma. Does the organization have a positive influence on a priority in my life, such as my children? What do I get out of the experience personally? Am I truly helping a broader good or cause? Will the online interaction improve an aspect of my real life community or career? I recently had an exchange with a friend during which I recalled that at different periods, his energy level on certain issues seemed to go up and down. That got me to thinking about my own energy and attention levels. 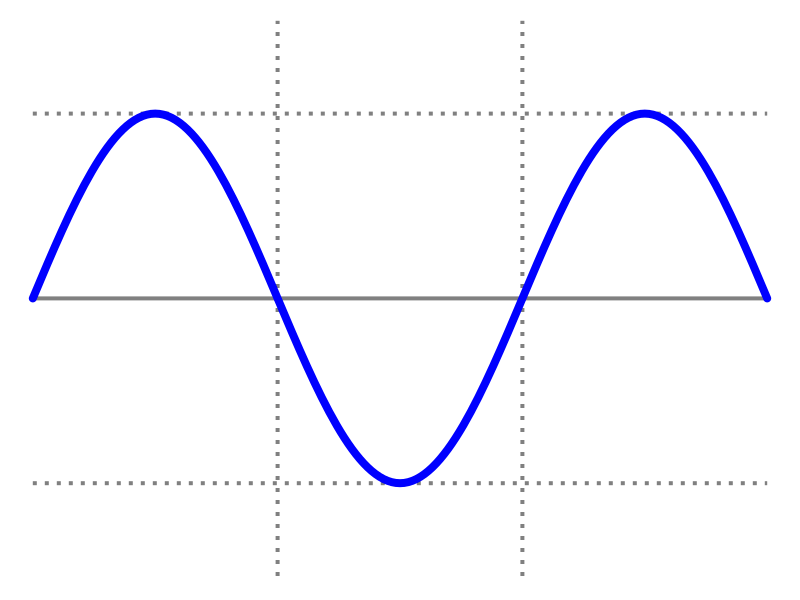 I have long been aware that my effectiveness and energy follow a pretty strong sine wave. It’s not as severe as a bipolar thing — just a sine wave. Sometimes I am way engaged and on top of it . . . othertimes it is a struggle to mark even administrative work off of my to-do list. No surprise there. I suppose everyone goes in the same sorts of sine waves. But then I got to thinking about the period of my particular wave. I think it is about fifteen days from zero to zero. In other words, If I start the month at zero (or “neutral”), I’m likely to have a peak of energy around the 7th, get back to “neutral” around the 15th, and then be in the dumps around the 21st. In my experience, the peak time can be pretty awesome and include prodigious creativity, indeed the whole upper third of that part of the curve is cool. The lower third of the “down” curve is not exactly torture — but I am in trouble if there is something I need to really push on at that time. I get things done, but it is hard to do my best work. It would be worthwhile to test this and catalog it. Give myself a “score” every day in terms of energy and effectiveness level, and track that for a couple of months. That will show me (a) whether the hypothesis is right; and (b) what my period is. If I do have such a sine wave, it might be a good idea to predict the peaks and valleys and jigger my work schedule accordingly. I assume other people have such a wave — what is their periodicity? If I can figure that out for colleagues, I can more effectively work with them (in the same way that it is helpful to know my own and others’ Myers-Briggs temperaments). What’s your rhythm? How do you know? Posted on February 6, 2009 February 5, 2009 Categories daily life, Uncategorized, workLeave a comment on What’s Your Rhythm? The NFL has built a perfect version of the Panopticon. In 1787, one of the great thinkers of English history, Jeremy Bentham, proposed a new design for a prison. He called the design the Panopticon. The idea was simple: from one point in the center of the building, a single guard could see any inmate at any time. All of the inmates knew this, but could not tell when, or whether, they were being observed. The concept was intended to promote the moral development of the prisoners, as the constant possibility of scrutiny would serve to make them less likely to behave badly. The Panopticon was a leap forward in its day. Designed to replace the infamous Botany Bay, it was among the first prisons to incorporate the idea of rehabilitation rather than punishment. Instead of being seen as beasts, prisoners were now assumed to be able to regulate their own behavior. Bentham’s design would have provided the motivation for them to do so. The NFL has created its own Panopticon by instituting a new system where fans can discreetly send text messages to a central location during a game in order to report unruly and obnoxious fans. Now, when you are at an NFL game, you must always assume you are being watched and that your actions may at any time be reported. That sounds scary, but why? It’s my belief that one of the reasons people behave so poorly in public is that they have no sense that anyone else might actually care or call them on it. The NFL’s system creates a feedback mechanism where one didn’t exist before. What’s interesting to me is how long it has taken for this to come about — and what the possibilities are for the future. Where else might a system like this be instituted? Even more interesting: Where might the Panopticon grow organically, without an institution having to build it? Neighborhoods? Shops? Dog parks?